This has to be one of the most delicious and naughtiest desserts out there. 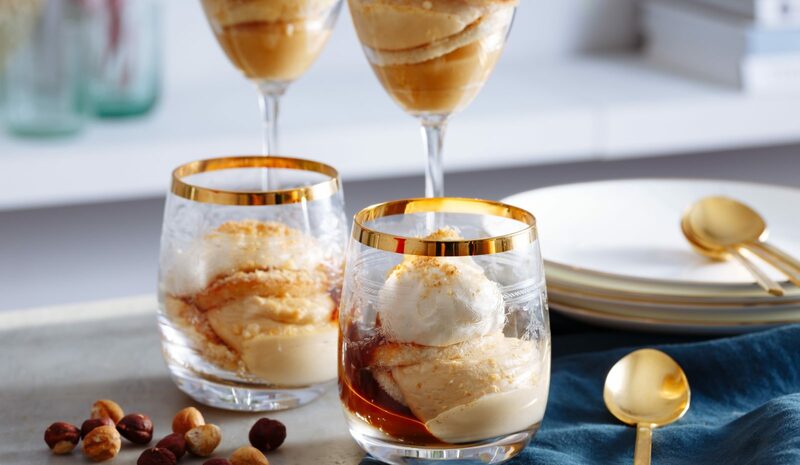 Its smooth texture with hints of spiced boozy creme patissiere, really make this dessert one to whip out at Christmas time when entertaining guests. They’ll be so impressed and it’s such a showstopper. 1. Dissolve the sugar and water in a pan, stir on a low heat until all the sugar has dissolved. 2. Bring to the boil and add the spices and simmer for 5 minutes. 3. Set aside and leave the syrup to infuse and cool down naturally. 2.Once the syrup has reached a dark caramel colour, remove from the heat and add the butter and cream. Set aside to cool completely. 1.Peel, core and cut the pear up into bite sized chunks. 2.Melt the butter and sugar in a pan. 3.Add the pear and stir to coat in the butter and sugar and leave on a low heat to caramelise and cook down slowly. 4.Strain some of the spiced syrup into the pan (catching the whole spices in the sieve) and simmer until the syrup has reduced and cooked the pear through completley. 5.Transfer the pear into a blender and puree until smooth, taste to check sweetness and adjust to your liking. Set aside to cool. 1.Set 1 tbsp sugar aside in a bowl and add the rest to a pan with the milk and cream. Bring to a simmer and take off the heat straight away. 2.Meanwhile, add the egg yolks to the bowl with the sugar and whisk until combined, stir in the cornflour until smooth. 3.Slowly pour the milk and cream over the yolks while whisking. Wipe out the pan and return the mix to the heat. 4.Whisk whilst bringing this back up to boil, this should take around 1 minute, do not allow the mix to stick to the bottom of the pan. 5.Pour through a sieve and into a clean bowl and allow to cool. 6.Add 60g of the caramel to the crème patissiere. (You can season with sea salt flakes at this point to balance out the sweetness, add to taste if required). Once you have all the elements ready you can build your trifles. Stamp out rings of sponge with a cutter to suit the size of glass you will build your trifles in, 2 sponge rings per portion. Brush half with grand marnier or another liquor of choice. (If you decide to keep this alcohol free, you can use the spiced pear puree to soak the sponge). 1.Start with a tbsp of the spiced pear puree in the bottom of the glass. 2.The un-soaked sponge on top. 3.Followed by the caramel crème patissiere. 5.Drizzle a little caramel down the sides of the glass. 6.Finish with softly whipped cream and grated roasted cobnut/hazelnut.